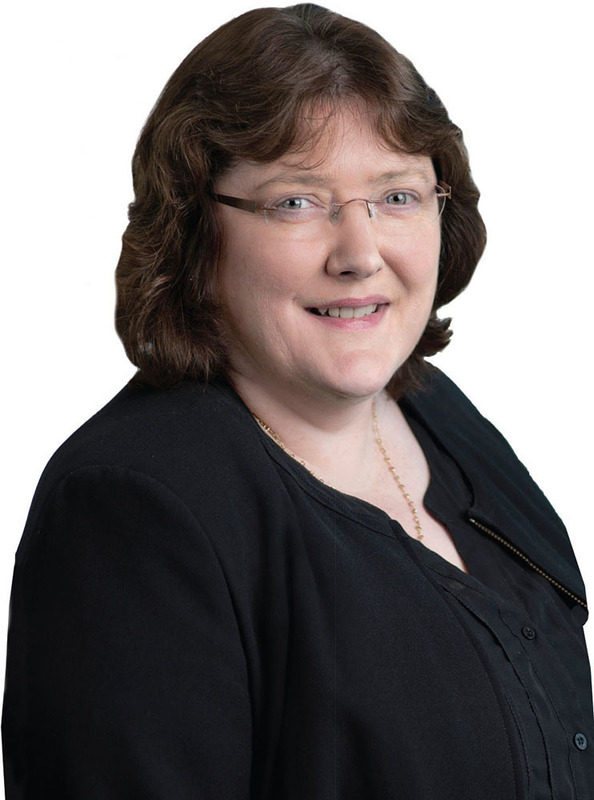 Intel’s Dr. Ann Kelleher believes that the effective use of data and analytics holds the key to smarter products, machines and future factories. One of the legends of the U.S. technology industry, Intel Corp. has come a long way since its founding in 1968, by Robert Noyce and Gordon Moore, as a manufacturer of memory chips. Today, Intel is a $59 billion maker of processors, memory, field programmable gate array technologies, and software for the cloud, data centers, personal computing products, autonomous vehicles, communications devices, and connected devices in the emerging Internet of Things market. Intel’s manufacturing footprint includes nine production sites, which are located in Ire-land, Israel, New Mexico, Arizona, Oregon, China, Vietnam, and Malaysia. In these factories, the company makes well-known brands such as Xeon, Core, Celeron, Pentium, Atom, and Quark processors. In our latest Dialogue with a manufacturing industry thought leader, Intel’s Dr. Ann Kelleher, Corporate Vice President and General Manager, Technology and Manufacturing Group, talks with Executive Editor Paul Tate about her role in strategic planning for the company’s worldwide manufacturing operations, Intel’s emerging business with the Internet of Things, and the challenges of smart decision-making in a data-intensive world. Q: What excites you about your role at Intel? A: Honestly, what excites me is being part of the manufacturing organization, which is the most advanced manufacturing organization in the world. We make the products that are powering the technology moving forward within the world – data center and PC technology, memory, and more. Equally so, our manufacturing sites are very advanced as is our end-to-end supply chain. And it’s not just making the products, but getting the products into the hands of customers that enables us to change the world. Our vision is that if it’s smart and connected, it works best with Intel. Q: With such a broad scope, I presume there are a few challenges. What still keeps you awake at night? A: The good news is I sleep very well. When I look at the challenges we’re facing, the good news is we have a rapid rate of technology change which we are powering. The issue is: how do you harness the advantage of that back into our manufacturing and back into our supply chain so that we enable ourselves to deliver in the most cost effective and efficient manner? Q: What would you specifically point to as being some of the difficulties of making the most efficient and cost-effective things happen? A: Sure. I’ll break it down into a couple of parts. First of all, I’ll come at it from the supply chain. We have large amounts of data. We’re data-rich, but the technology and the ability to turn all of that data into key information so that we can make smarter, more efficient decisions can be a challenge. That’s a key piece of work with the supply chain right now: how can we use our own technology? How can we move our technology, from machine learning to AI, to parts of the data analysis that basically don’t need as much human intervention? How can we move that so that there’s smart decision-making within it and that we’re moving up the chain in terms of the value we’re bringing, in terms of where people need to intervene and make decisions? Q: Grappling with the tsunami of data to turn it into something actionable is a challenge a lot of companies have. Mindsets can stand in the way. Has Intel been able to overcome that issue from a cultural perspective? A: I believe we’re making good progress on that. Maybe I need to stand back. I’m with Intel for 22 years. The factories are used to change because we implement new technologies approximately every two years and, with each new technology that comes into the factory, the bottom line is everybody expects that they need to learn how to run the new technology to enable new generations of products to be made. People are used to that learning mindset. Back in 1999/2000, we made the transitin from 200-millimeter silicon wafers to 300-millimeter silicon wafers. At that point in time, we also made the transition into automation within our factories. That change was a significant learning process and really moved us forward in the use of data to enable production in our factories. Since then, we’ve constantly been evolving, and that has helped create the mindset that this is key for us to become more productive, more efficient, and to enable our production. Q: What key market, technology, or business factors would you highlight as being critical to your product development and manufacturing strategy over the next few years? A: Our vision is of a smart and connected workspace with Intel. First of all, data is a big deal for all manufacturing. How do you go from being data-rich to information-rich? Our key products are CPUs for servers and PCs. We’re also in the memory business. We’re in 5G connectivity. We’re in Internet of Things (IoT) smart connectivity. The bottom line is we’re looking at how we support the cloud, AI, and all the networking connectivity. It’s all about how we enable a smart and connected world where data is king. Data is enabling the technology to move the world forward and to make the world a better place. Q: You’ve mentioned the Internet of Things. This must be a massive potential opportunity for Intel now. A: Yes, it is. It has a huge potential because, basically, it’s taking us into a new world where machines are smart. This is all about how we build sensors and intelligence into “machines,” so that, for example, refrigerators can become smart refrigerators and manufacturing equipment can become smart equipment. Today, they produce a lot of data. The question is how can this data be used to alert a technician about an issue, such as equipment failure, before the event happens? Within our factories, we have done quite a few experiments. Some of them can be very, very simple. For example, photoresists used in lithography are kept in a fridge. There needs to be temperature control. Now, at home, if a fridge goes out, you probably notice it because the butter is a little softer than it should be; that’s probably the first clue. We have come up with a really neat way of actually doing smart sensors within the fridge — smart sensing of the temperature. By being able to monitor the environment of the fridge, if it’s starting to drift outside of the control specs of the lithography, it’s able to send an alert to the engineer or the technician who looks after that fridge. That may sound very simple, but that, in itself, can save quite a lot of time because, if you process with photoresists stored at an incorrect temperature, it can lead to very expensive product problems. So, while it may be a very simple fix, it has a very big impact. That’s one very simple example. Education: Bachelor’s degree in electrical engineering; Master’s degree in engineering science; Ph.D in micro-electronics; all from University College Cork (UCC), Ireland. Previous roles include: General Manager, FAB/Sort Manufacturing, Intel Corp.
Plant Manager, Fab 11X Plant, Rio Rancho, NM, Intel Corp.
Plant Manager, Fab 12, Chandler, AZ, Intel Corp. Factory Manager, Fab 24, Leixlip, Ireland, Intel Corp.
Q: What’s your view on Manufacturing 4.0? How far along the journey do you feel you’ve traveled so far and what have you yet to embrace? A: I believe we have moved fairly far along the journey. Do I think we’re fully there? No, I don’t. What we buy from our equipment suppliers today produces a certain amount of data. That data waits for someone to look at it. I believe there’s a method by which we can actually make the machines smarter in terms of when maintenance needs to happen. It basically moves us much more into the predictive maintenance space. I believe there is a lot more where the use of IoT-type sensors within the overall manufacturing environment can bring us to the next level. I believe we have a ways to go but I believe we have come a very long way on this journey. Q: So this is really moving towards an artificial intelligence environment with cognitive systems and machine learning? A: Correct. I believe there is a lot of opportunity for that because today, quite often, a human has to interpret the data. Some of the data that needs to get interpreted is, I would say, infrequent data points and you could have many different employees looking at it; whereas, if you’re working infrequent data points and not difficult decisions, there is absolutely no reason why that can’t start moving into machine learning, AI, cognitive systems, or whichever method we choose. I think there is no reason why we can’t move into that and start moving the use of our employees’ talent up the value chain in terms of the decisions on the data. Q: How’s it been going? Have you actually been able to apply that technology in a way that’s given you some insights and lessons that you can act upon? A: I think it varies. Within our supply chain, we currently have removed some of the lower decision-making tasks. We’re piloting a number more. Come ask me in about six to nine months’ time and I’ll give you my next update. Q: Are there any key lessons that you’ve learned about the best way to use data that other companies in the manufacturing industry may benefit from? A: First of all, I would say, we produce a lot of data. How much data do you really need to store and how long do you want to store it for, and then what information do you need from it? I think that’s one thing that you need to get very clear on because, as I said earlier, you can get a significant amount of data, but how do you extract the information from it? The second point is: what is the ROI from it? You can do a lot of analysis but you need to be very, very clear, as you’re lining up to analyze something. What am I going to get back? Developing software is not inexpensive and developing the systems around it is not inexpensive. There is not just the analysis of data but the concentric circles with gathering that data. What is the ROI and my investment to get this data? I think people need to be very clear in terms of what they’re going to get from it before they embark on actually going and gathering all the data. I think the third point is security. Security of the data is a big deal because the data could get corrupted. It could also get into the wrong hands. How do you make your data secure so that only the people who need access to it, to do the analysis, have an absolute need to know and get the data? Another piece is standardization. One challenge I would say that I see across the industry has to do with data systems and data formatting. Our suppliers have their data system and their data formatting. Our customers have their data systems and their data formatting. Even within a given company, you can have very different data formats and data systems. How do we standardize when we need to share data in from the outside or inside out? What is the standardization and what is the method by which we can do that so it isn’t a constant challenge of converting data formatting so that somebody else can use it? I think standardization is a big one. Q: Who do you think is going to solve that problem? A: I think it’s an excellent question. Typically, standardization bodies supported by the industry usually work best. Q: How do you see the development of increasingly intelligent products changing the dynamics of what Intel does as a manufacturing leader? A: One way of looking at it is looking at the industrial revolutions. The first one was with steam and coal. The second one was with electrification, oil, and mass production. The third one was with IT and automation, which ties in quite nicely with us moving to automating our factories. I think now we’re heading into the next one, which is the IoT industrial revolution. I think, fundamentally, it will open doors of information for us that we never had before. When I joined Intel 20 years ago, the reality was I had a desktop and I wasn’t going to be bringing that anywhere with me. Right now, I’m moving around with my phone and my laptop and my life is a lot more productive than it was 20 years ago. I think IoT will fundamentally change our world because it means the machines that we interact with will move forward to being able to sense their environment and utilize data so that they are able to actually do some of the basic intelligence around how they need to operate. I believe that will make us more effective, more efficient, more productive. Q: What are the most important initiatives you have in your manufacturing plants in the next 12 months? A: Well, from our manufacturing plants in our next 12 months, we’re getting our next technology, which is 10 nanometers, so that’s going to be a very big deal, getting that ramping and running. It’s going to be very exciting for the manufacturing plants but, equally, it’s going to be very rewarding in terms of the technology making the new products. Q: What would you highlight as the greatest challenges and opportunities for the manufacturing industry, generally, over the next five years, as it embraces a digitally-driven future? A: Right now, a lot of what we’re doing with smart IoT is an add-on when we’re done building our factories. From a manufacturing organization perspective, how do we enable it to be built in from the start so it’s not an add-on at the end? If it’s designed in from the start and built in from the start, then we can get a much more efficient use of smart factories and it’s not an added cost at the end; it becomes a part of the up-front manufacturing enablement. I think that’s going to be one of the single biggest things as the manufacturing industry moves forward: how does it get it from the start, rather than being a tack-on at the end? Q: In terms of the leadership skills required to operate a manufacturing enterprise in this new future, what do you feel is going to be required for leaders to be able to exploit this industrial transition? A: Be open to change. That’s the single biggest thing for the future of manufacturing leadership. Be open to new concepts and grow new skills within your organization because it becomes about utilizing or harvesting the data to enable smart and rapid decisions. And I think that needs to be top to bottom within the organization. A: I would say “harvest the data to enable smart decisions.” That enables a smarter, more productive, and efficient working environment to enable us to be overall more efficient and productive manufacturing organizations.